If you own an off-road utility vehicle then you know the need for speed is a real thing. It seems like when you first buy your ATV, UTV or Dirt Bike it is exactly as fast as you want it to be. That feeling fades over time and is replaced with the need for speed as you become more comfortable with the vehicle. If this describes you, then you are at the right place. In this article we searched the web and used our experience to come up with a list of six effective ways to improve the top speed of your quad. This includes both engine performance upgrades as well as adjustments to your chain, gears and tires. Take a moment to read the information below and let us know your thoughts at the bottom of the page. The simplest method of increasing speed on your off-road utility vehicle is to adjust the throttle screw. Your throttle lever attaches to the throttle cable and sends power by pivoting on a screw, pulling the cable and opening the throttle. 99% of dirt bikes and quads have a throttle limiter screw which is used for adjusting the amount of movement in the lever. Turning the screw clockwise pushes the screw into the throttle lever housing and limits the amount the lever can be pushed. Turning the screw counterclockwise backs the screw out of the housing and allows the lever to be pushed further, and in turn allows the vehicle to rev higher. Higher RPM = More Speed! In the most simplest terms, the engine in your off-road vehicle works by pulling air in, mixing it with gas, compressing and exploding it and then releasing the exhaust. If you think in these terms, then understanding how to improve the engine performance and top speed becomes much simpler. Your first option, and often the cheapest and easiest when it comes to engine performance is to improve the airflow. Increased airflow, combined with more gas, creates additional power and top speed. You have two options when it comes to improving the airflow: Get a Better Flowing Air Filter or Reduce the Impedance of Air. Most stock air filters are design with the main purpose of limiting the amount of contaminants that enter the combustion chamber. They complete this task by using thicker and more dense foam to filter the air, but this reduces air flow and limits power. In conjunction, a stock air box is designed to reduce the chance of water or dirt gets to the air filter, but this reduces airflow and power. 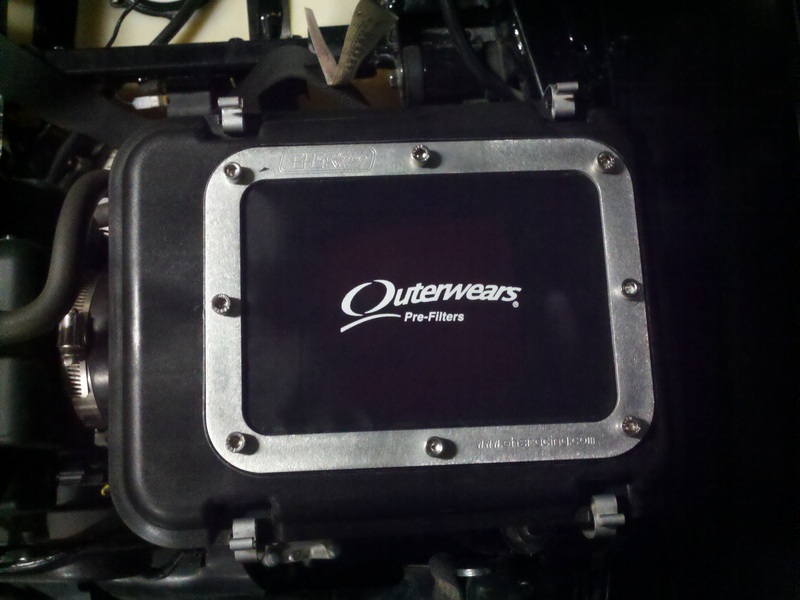 The world of aftermarket air filters is large and can be confusing when deciding what you need. Big players like K&N and Unifilter provide your safest alternative to a stock air filter set up. Both of these brands are known for their quality and performance (K&N has a huge market presence with automobiles), and they publish tests consistently that prove they work. With improved air flow, you should expect around a 2-4% increase in top speed when paired with the appropriate jetting. 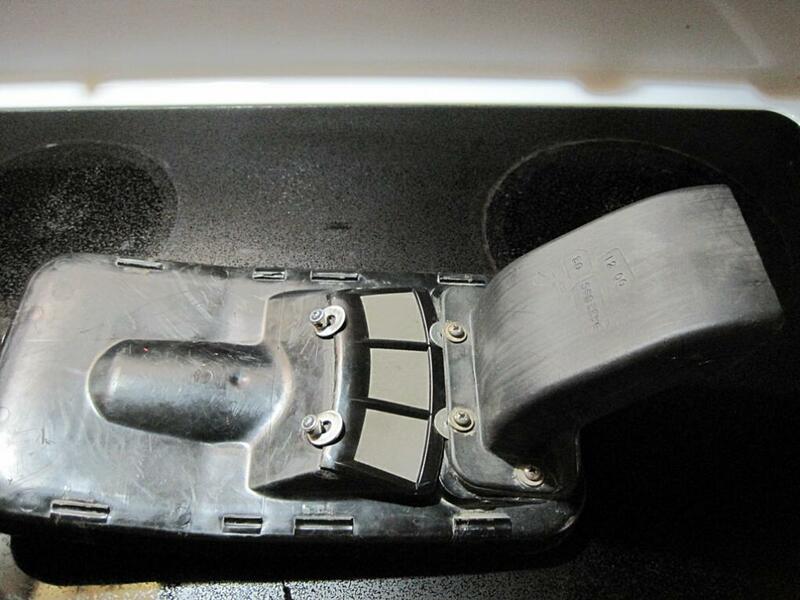 Your other option to increase airflow is to open up the air box. Stock air box applications are sealed to protect the air filer, and have one entry point for air (normally under the gas tank). This restricts air flow, which in turn restricts power. Opening up the air box (using one of the methods below) will increase air flow but also puts you at a higher risk of water entering the intake and possibly hydrolocking the motor. This upgrade is most popular among sport and racing quad owners because of riding through deep water or heavy rain. Check out some of the examples below to see what I am talking about. The other simple method to improve your engine performance is by increasing the exhaust flow. This can be done upgrading your exhaust system or lessening the restrictions within your stock set up. Depending on the engine size and RPM, the amount of exhaust produced will differ. Most ATV, dirt bikes and UTVs are designed with an exhaust system that has been tested extensively and can handle the stock performance of the motor, but when you start upgrading other parts of the motor you limit their potential by not upgrading the exhaust too. If you increase the air flow into the engine, increase the engine displacement, or change the air/fuel ratio (jetting), you need to adjust your exhaust system to handle the increased exhaust production. A restrictive exhaust system can impact performance and also cause the engine to backfire. Don’t get me wrong though, exhaust upgrades don’t have to be done ONLY when other parts are upgraded. Just upgrading the exhaust with other any other upgrades will still improve your performance. Most upgrades typically result in improvements of 2-4% over stock speed. Companies like FMF and DG provide exceptional aftermarket exhaust systems for most ATV, dirt bike and UTV models. A lot of time is spent fine tuning an engine at the factory to maximize a potential. That fine tuning however is with all stock components, so that tuning must occur again when you make alterations to stock compnents. Most carburetors include 2 jets, a main and idle jet. The idle jet provides fuel to the carburetor when the vehicle is at idle, and the main jet provides fuel at all other times. When you change the amount of air flowing in or out of the engine, you need to adjust the fuel ratio by changing the jets. 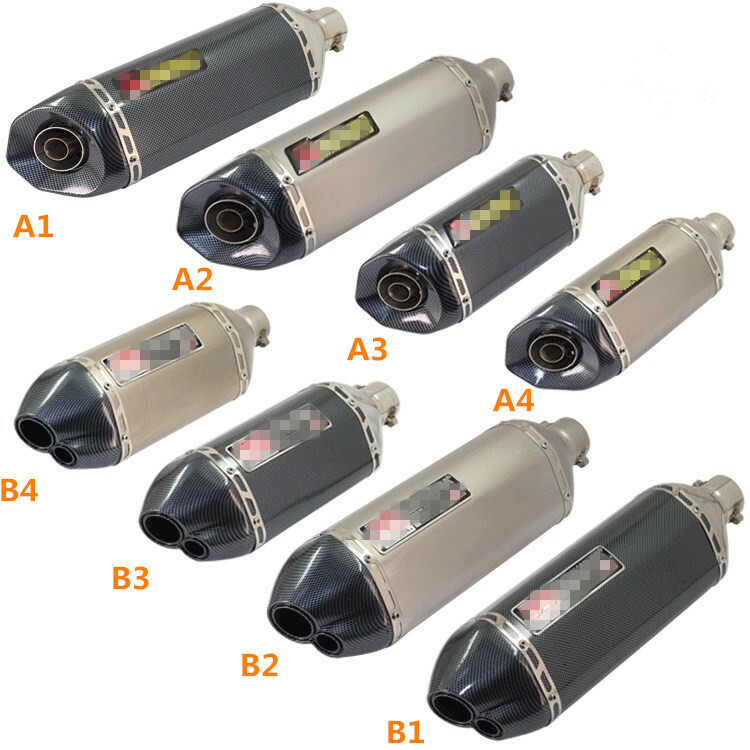 More air requires more fuel to maintain the stoichiometric ratio that combusts best in the cylinder. 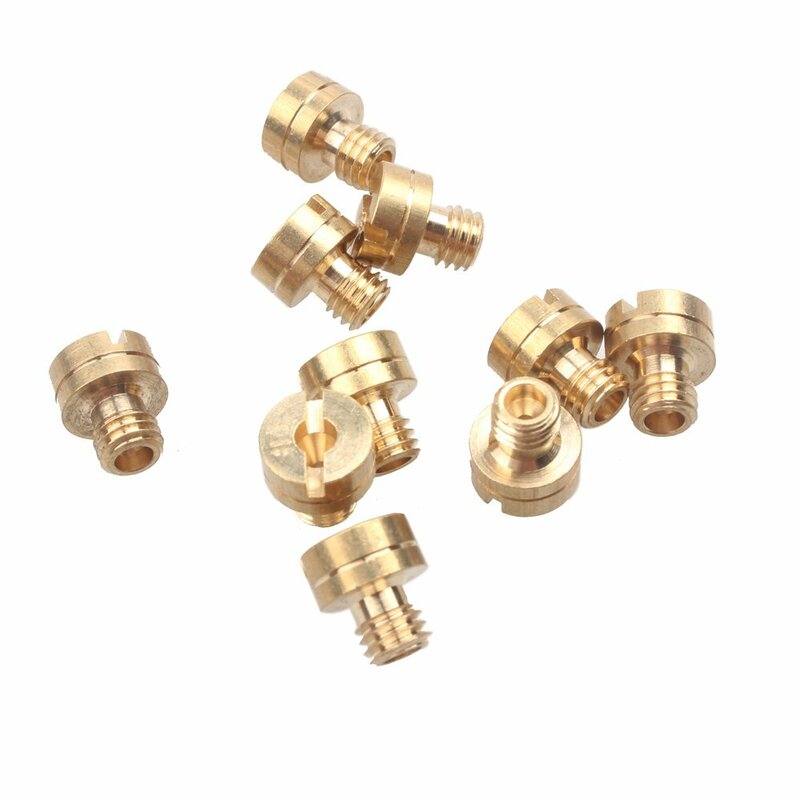 You can find different size jets on eBay and Amazon for almost any carburetor, choosing the right one however is where science is needed. Your best bet is to look up the stock size jet for your carburetor and then move up from there. I prefer using Dynojet Kit when re-jetting a carb, because you get a multitude of jet sizes to test and most kits include a chart for deciding on the proper size. For example, on my Yamaha Warrior the stock size jet was 155. After modification of the exhaust and intake, I increased the size to 157 to get the best performance. 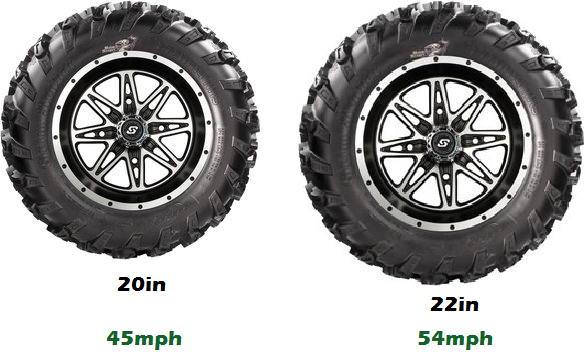 This method is best used on your ATVs and UTVs because increasing tire size requires more space under the vehicle. Dirt bikes are not ideal because the front fork and rear swing arm don’t allow wider or taller tires with heavy modification. ATVs and UTVs are easier to lift with spacers and new shocks. Similar to tire size, utility vehicles that use a chain and sprocket in their drivetrain can gain speed through adjusting the sprocket ratios. You can adjust either the front or rear sprocket, as long as the ratio of teeth increases. For instance if your current set up has a 14 tooth front gear and 47 tooth rear gear, you will either need to increase the front gear size or reduce the rear gear size in order to gain speed. The current set up has a ratio of 3.357. If you drop down to 13 teeth up front the ratio increases to 3.615 which is a 7.7% increase in top speed. If you increase the rear sprocket size to 48, the ratio increases to 3.428 which is a 2.1% increase in top speed. Here is a good calculator for estimating new top speed after a sprocket change. As you can see, adjusting the front sprocket will gain more speed, quicker while the back sprocket will allow you to fine tune your top speed. You also have to remember that changing the sprocket sizes has an effect on your torque. There is an inverse relationship between the top speed and torque when adjusting the sprocket sizes. Increase the speed and you decrease the amount of torque.